This year, Legacy Lockers was a proud exhibitor at the 2014 CMAA World Conference & Club Business Expo, put on by the Club Managers Association of America on Feb. 7-8. As one of the exhibitors at the Club Business Expo, Legacy Lockers teamed up with hundreds of companies and exhibitors to share information about products and services that club managers can implement in their locations for better service and increased business success. The CMAA services club managers around the U.S. by providing materials, education and certifications that help enhance and qualify the careers of club managers in the U.S. They do this by providing access to valuable information, classes to enhance their leadership skills, and access to important tools that can help with professional networking, career development, and personal enrichment. The CMAA conference is important because it helps those in the club management industry understand and keep up with the latest trends that can help their businesses succeed. As a maker of top-of-the-line, high-quality custom wood lockers for athletic clubs and the like, Legacy Lockers was excited to give CMAA members an exclusive look at the products and services available for their clubs. 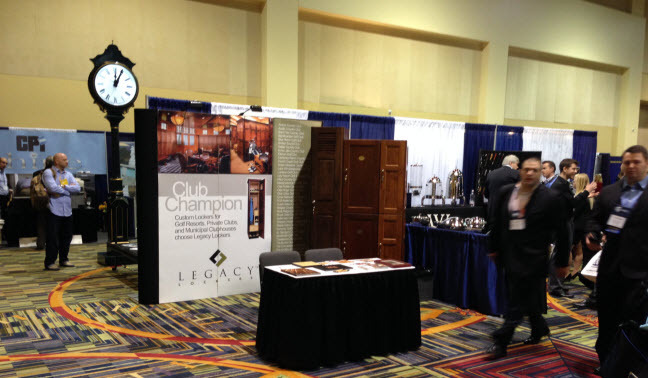 Taking place in Orlando, Fla., the CMAA conference gave Legacy Lockers a chance to showcase their materials in booth number #204, giving conference-goers a glimpse of the legacy of their custom wood lockers and what they can do for specialty clubs everywhere. While the CMAA national conference traditionally attracts an attendance of 5,000 or more members, there are many more who are unable to attend in person. Those who were unable to attend this year’s CMAA conference live can follow all of the information presented in social media, including news about the show and much more, by searching for #CMAAConf.